It’s 1973. Winter is in love with skater-boy Nicky. Winter’s big brother Joe is in love with high school queen Amanda. Winter’s mum is fighting a housing development threatening to take over one of the few remaining park-lands in their town. Winter thinks her life couldn’t get any more confusing and complicated. And then, Amanda is found dead in the river near their home. What comes next is a tumultuous whodunit with Joe and his seemingly tight-knit group of friends becoming the first suspects in the investigation into her death. Winter doesn’t know what, or who to believe. The facts she begins recording in her diary become fuzzier with each passing day, until she doesn’t even have solid theories. Why would Amanda kill herself? Or, more frighteningly, why would someone kill Amanda? What dark secrets are being hidden behind the supposedly white picket walls of suburbia? Dark Water is a story about trying to navigate teenage life in 1970s Australia, while also having to try and cope with increasingly adult situations. 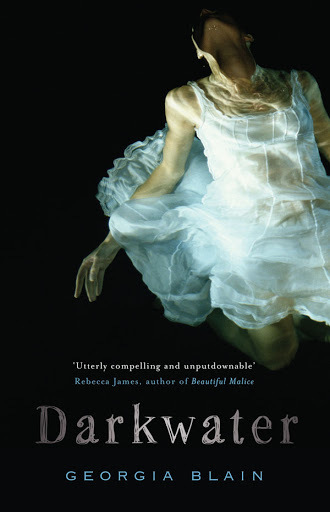 I found Dark Water to be an interesting read, however it seemed to have too many story-lines that were left abandoned in the end. The way I see it, if you bother bringing up a plot-point, you should follow it through to conclusion. Not leave it hanging and your readers wondering why it was even there. The whodunit nature of the story was well written, with the true series of events not being easily guessed until Georgia Blain was ready for us to know. The characters were likeable, slightly cliched in their own 1970s way (think Puberty Blues) but they had enough layers to remain interesting for the length of the novel. I wish we’d got to learn more about some of the characters – Winter’s best friends Cassie and Sonia were given the beginnings of depth but it was never fully explored. Blain attempted to create 3D characters within her novel, but unfortunately some just failed to push the threshold from 2D. It’s the kind of novel that you can only really read once, because once you know the ending the mystery, and therefore a large part of the appeal, is taken away. But it’s an enjoyable first read. It probably suits the younger end of the YA spectrum – although some heavy themes are covered – however all in all, I did enjoy it. Next book for you to read: Wonder by R.J. Palacio. It's a YA novel that, despite me being the kind of person who leans towards a more challenging read as a general rule of thumb, fell in love with on the first page. It's really well written and tells a story that everyone can relate to in some way or another. It's a story about the brutal realities of life, and of growing up, and of human nature. If you haven't read it already, please do.